Late Tuesday evening, conservatives were aghast to find they’d lost thousands of Twitter followers in what appeared to be a wholesale purge of bots from the platform. Rather than admit that their social media influence is exaggerated by the clustering of these trash accounts, they cried censorship, begging for refollows from loyal fans — people who, it bears repeating, do not exist. The facts are whatever you prefer. This is how absurd, gaslighting "crisis actor" theories go viral. One @facebook post from this person has 111,000+ shares. Another has 23,000. This is one person, two posts. As with much that’s rotten in America today, Trump set the stage for this break by advancing disproved theories of hoaxes and nefarious political subterfuge; the refusal to acknowledge what happened at Marjory Stoneman Douglas High School is, by one accounting, a denial no different than that offered by a climate change “skeptic” who assumes it’s Chinese propaganda. And like a weather truther, a “crisis actor” troll is supposedly “just asking questions,” trying to peel back layers of disinformation to reveal a deeper plot. Yet this mindset also clearly precedes Trump and operates apart from him. He benefits from it, suffers from it and panders to it, but it isn’t his to control. The whole crisis actor scenario, for example, has its beginnings in older, stranger distortions. To begin with: Are “crisis actors” an actual thing? Yes. The term applies to any professional or volunteer who portrays a disaster victim in training sessions for emergency services or military personnel. They do not, as the name might suggest, perform for cameras, but right-wingers have taken to painting them as extras in the fabricated televised drama that is the United States, linking to headshot-laden, though defunct, hiring websites to argue that such actors constitute a large professional class. 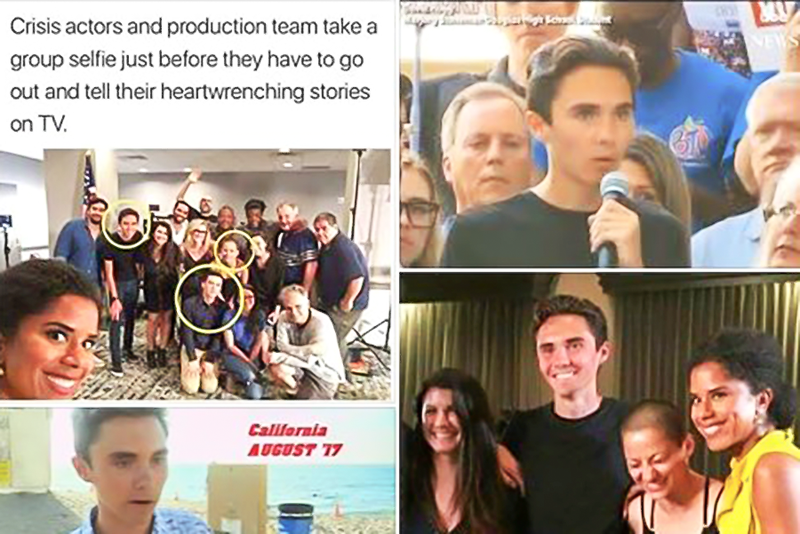 Even so, as the meme above shows, they rely on the “repeat” appearances of specific actors to connect the dots in their feverish fantasies of “false flag operations,” which is to say illusory mass-casualty events staged for the benefit of various shadowy forces. The idea seems to have first taken hold in early 2013, following the shooting at Sandy Hook Elementary in Newtown, Connecticut, in which 20 children and six adults were murdered. Exactly a month after the massacre, YouTuber Jim Nichols, who describes himself as a strong supporter of the Second Amendment, uploaded a video — which is still hosted on the site — titled “The Sandy Hook Shooting Fully Exposed.” His crackpot narrative relied on the ordinary confusion and contradictions of breaking media coverage to suggest a large-scale “deception” involving actors hired by the Department of Homeland Security to portray grieving parents. Debunking this “mixture of misinformation, innuendo and subjective interpretation,” Snopes traced the conceit to a since-vanished website called WellAware1, whose author, Ed Chiarini, insists pretty much everything you see on the news is fiction and that any recognizable celebrity is “played” by an actor or other famous figure. Chiarini, also known as “DallasGoldBug,” has the air of a harmless nut when he’s claiming that Tupac and Dave Chappelle are the same person; it’s more disturbing when he posits, as he did on YouTube and GoFundMe, that the Columbine shooting was a drill enacted with mannequins. In retrospect, it’s obvious why Second Amendment fetishists latched onto the crisis actor angle in the wake of Sandy Hook, leading to its amplification by far-right outlets like InfoWars and Gateway Pundit. The slaughter of first-graders was the single most appalling indication yet of the desperate need for gun control in America, and it renewed the outcry for protections against this violence like never before. With no available moral justification for prizing the right to bear arms over the loss of these young lives, gun-worshippers were forced to weave the lie that no such killings occurred. But for that to be true, powerful organizations would have had to orchestrate the tragedy, and they would have done so only to advance a hidden agenda. Given the persecution complex of a conspiracy theorist, that agenda inevitably turns out to be the disarming of citizens. What’s weirder still is how they’ve gone back to previous American traumas to retrofit them with this particular strain of insanity. By 2014, you could watch videos purporting to expose the 1995 Oklahoma City Bombing as an actor-driven hoax and the deadly 1993 siege at Waco as a military drill. Crisis actors allegedly portrayed 9/11 witnesses and reacted to JFK’s assassination. Once you submit to this logic, all of history is up for grabs and infinitely malleable. In the meantime, the far right appears to be using their own paid actors to win spin wars. Now outspokenly activist, the Parkland students pose a challenge to the cult of firearms every bit as unprecedented as Sandy Hook, which necessitates a fusion of related themes: Since all shooting victims are crisis actors, and all grassroots resistance to conservative rule is a charade put on by “paid protesters,” the Marjory Stoneman Douglas teens are one and the same, funded by George Soros (or whichever liberal boogeyman) to counterfeit both a shattering agony and the popular response to it. That rhetorical maneuver isn’t just a dazzling display of cognitive shutdown in the face of genuine national crisis; it propels the most dangerous radical fringe further down a path toward the dismissal of literally everything not experienced firsthand. If you can’t depend on mass-distributed words and imagery to accurately represent the world — if “fake news” encompasses media in total — then you dwell in some eventless realm, a place defined by the solipsism of the senses. You can stand on the other side of the country and say that the kids on TV are hired stooges, that their school was no more than a movie set, that Florida doesn’t actually exist, but in doing so you lose the basis for the rest of your ontology: That Trump is a god-king, the economy is booming and mass shootings are unavoidable. To be a conspiracy theorist is to desire a solid, though secret, explanation, yet the shifting sands of the crisis actor premise forbid a root certainty as to what is really the case. And I don’t know about you, but as awful as these cretins are, I’d hate to see them when they finally realize they don’t believe in anything.